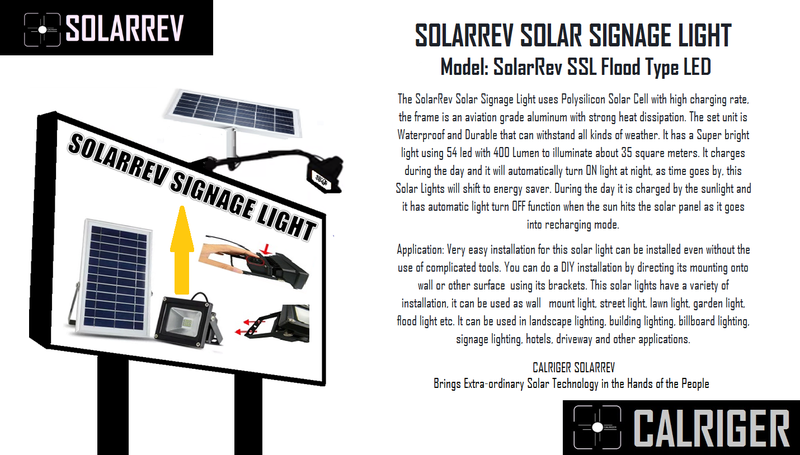 The SolarRev Solar Signage Light uses Polysilicon Solar Cell with high charging rate, the frame is an aviation grade aluminum with strong heat dissipation. The set unit is Waterproof and Durable that can withstand all kinds of weather. It has a Super bright light using 54 led with 400 Lumen to illuminate about 35 square meters. It charges during the day and it will automatically turn ON light at night, as time goes by, this Solar Lights will shift to energy saver. During the day it is charged by the sunlight and it has automatic light turn OFF function when the sun hits the solar panel as it goes into recharging mode. Very easy installation for this solar light can be installed even without the use of complicated tools. You can do a DIY installation by directing its mounting onto wall or other surface: using its brackets. The length of the power cable between the solar panel and light is about 4.7 meters. You can adjust the solar panel angle for optimum sun exposure.